This remarkable sequence of images was photographed last month by photographer LeRoy Zimmerman. 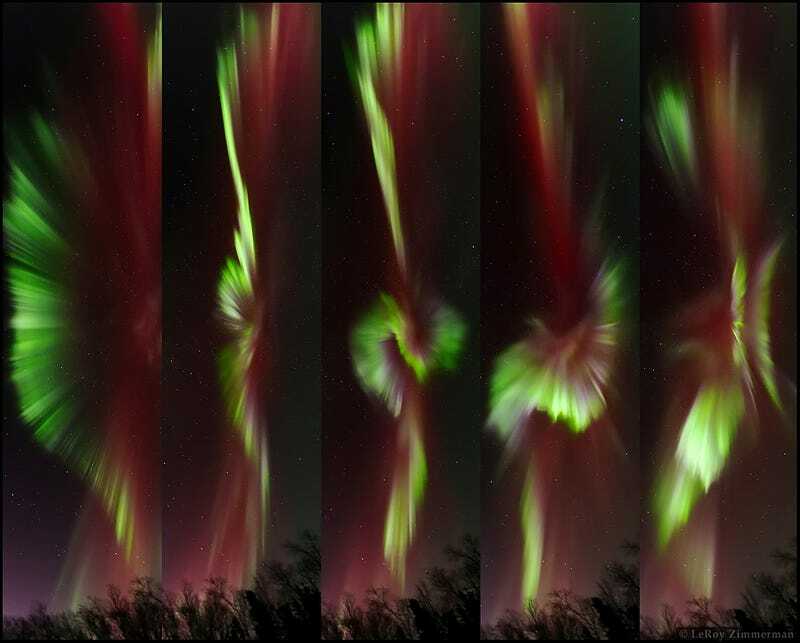 The images were captured last month over the (surprisingly long) course of thirty minutes, and depict roughly 500 kilometers of aurora unfurling across a 150-degree vertical stretch of subarctic firmament. Sez Zimmerman: "I have never seen an active aurora stay in one place for so long, ever!" It was a stunning and quick evening. It would have been very easy to miss this show if my timing getting out was off by just 15 minutes or so. Saw some aurora showing some pink on my LiveAurora iPhone app, so I decided I better get out and take a look. Luckily here is a shooting spot about 5 minutes from my cabin that I could get to quickly, and when I got there I saw an somewhat 'faint' band coming up from the western horizon and thinly spreading overhead. I took a color grab shot out to the horizon (just a quickie hand held shot to check color) and saw that faint band was really pink/red. I immediately set up and started shooting out towards the horizon and noticed that is was starting to build and move overhead. Took the camera off the tripod (quick release) and took another color grab shot overhead, and saw that was red as well. I immediately pointed the camera straight up on the tripod and started shooting. And the aurora started putting on an overhead show!! So just kept shooting, and shooting, and shooting. Kept thinking it surely had to start winding down, or that the aurora band would move to another part of the sky, but the band did NOT move and the show did not stop, it just stayed in place and kept changing and changing. So I kept shooting the same aurora for 25 minutes, taking a photo every 3 seconds, before it finally quieted down and began to fade away. I have never seen an active aurora stay in one place for so long, ever! And that single arc was the ONLY aurora in the sky! Took 500 shots without ever moving the camera once! I could not believe what I had just seen and filmed! A priceless evening for sure. Simply stunning. I've never had the good fortune to witness the Northern Lights in person, but it's images like these that invariably stoke the flames of my extreme-latitude wanderlust. A big thanks to LeRoy for allowing us to feature his work.